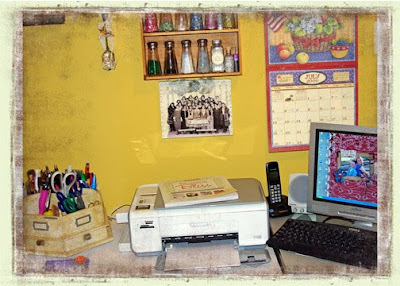 I just couldn't resist not joining in Karen's blog party "Where Bloggers Create". 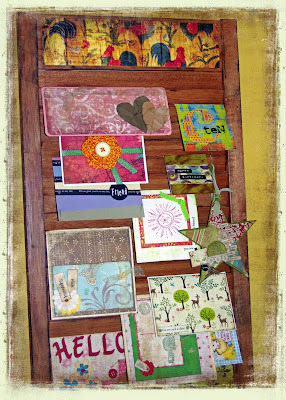 What a wonderful way to take a peak into fellow blogger's studios and see where they nurture their soul by creating. We finished our downstairs about a year ago and added this creative nook just for me. I so enjoy spending as much time here as possible. The table is long enough that my kids can also set at it and create with me. It is a place that I come to get away from it all. Where I get my hands dirty, my heart nurtured and inspiration is just a click away. I surround myself with things I love and that inspire me. By keeping some lovely treasures out on my desk it encourages me to play. You can find roosters and chickens spread throughout my studio. 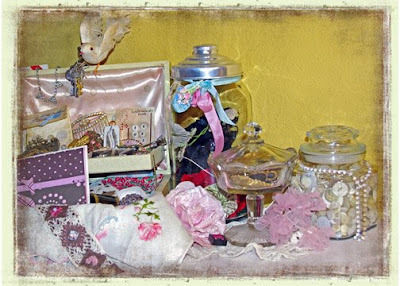 Cards to inspire and mean so much... Lace and goodies in jars so I can easily see them. Lovely flowers and button cards sitting out just waiting to be used. And of course, no studio would be complete without glitter. In the hallway, I combined 3 vintage drawers and hung them on end and filled them with family photos, cherished artwork and inspirational pieces just waiting to be added to my artwork. 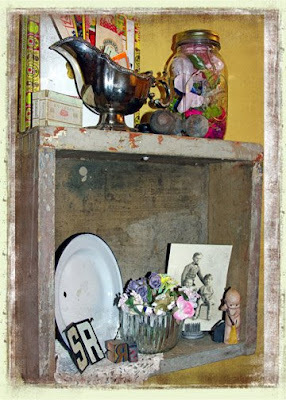 These are not only functional but they are art that changes as I use the treasures that I have collected and add more treasures as I find them. I hope you enjoyed taking a peak into my studio; a place that relaxes me, nurtures my need to create and sooths my soul. 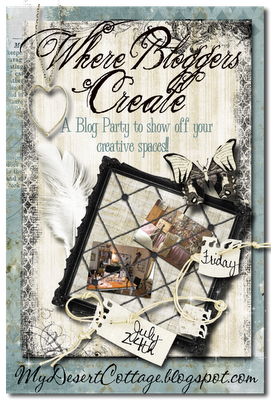 I can't wait to visit other bloggers creative spaces... hope you come with me! Thank you Karen for hosting such a lovely party. Love your creative spot! Your salt shakers full of glitter is an idea I may have to steal!! P.S. Stop in to see my Studio too! One of your Silver Bella sisters here popping in for the party! I enjoyed my visit here girl...I can't wait to meet you in November! Very artsy very creative and the yellow walls keeps it sunny and bright...it's very cheerful creative space. What a cute space! 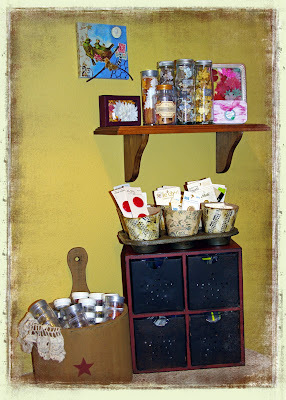 I love your glitter jars and your drawer "shelves"! I love your creative space. All that glitter, I just adore bling! Thank you for sharing your room. This is so inspiring! Hi Sheila - I love your space and the color of the walls! I'm with you - leaving things out that inspire and foster the creative urge is a great idea. Congrats on a great space! 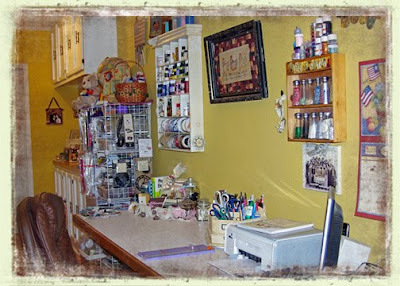 I love your creative space, and each special place you have your supplies organized in, you must be so inspired to create here. Love your happy creative space :) It looks so cheerful and the glitter containers were inspirational. Thanks for visiting me also. Your studio is so bright and inviting! I love the glitter shaker idea! Love it! it's so calm and nutrturing. I love the color on the walls! The sun is always shining! Very fun! It's a beautiful space for creating & inspiring:) Best of all, I know lots of happy times take place there! I love nonocromatic so much. Your spot is very comfortable. Thanks for letting me visit. I love the color of your walls! My favorite thing is the jar with the #40 on top. Did you make that? Really wonderful. I bet you have so much fun in there! Oh my...if there were a prize for most "creative" use of space, you would definately need to win it! Is that a magazine holder with the cards? And the glitter all in matching shakers...just grand!! Great space!! Looks like a lot of fun to be had there! Great space. Love your glitter station! Your art space is just perfectly wonderful! So fun to see how others work and play! Come visit me too! Love the area you create in!! Looks like a fun area to be in! Wonderful creative spot! Love the cheerful yellow walls and all your treasures. I love the color of the walls - too cool!Great stuff. Love the rich colors of your wonderful and artful space. I agree, no space is complete without glitter! 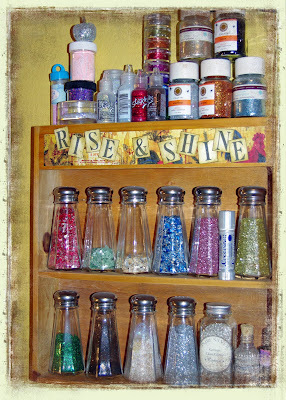 I used some old glass flavoring bottles I found at a flea market to house my glitter. Funny thing is that after I cleaned and filled the bottles and go to use the glitter I get whiffs of vanilla, butter rum, etc. I think i may have inadvertently invented aroma glitter. Thanks for sharing your space and have a wonderful weekend! I love it Sheila!! Those glitter shakers are fabulous!! I have a cream colored shelf that is empty(you can see it in the big space pic)You have inspired me to find some old shakers to fill with all my glitter!! Love it!! Thanks for sharing!! What a happy place in which to create!! I didn't get my studio pulled together quite enough to photograph for today's event, but I will be hosting a Christmas in July giveaway on my blog tomorrow (Sat), if you'd like to stop by! Hi! Love your place.. It looks warm and special.. So many lovely things. Love all the ways you organized and put things together. Love the old with the newer stuff. Thank you for sharing. Keep Creating! Hi Sheila! What a perfectly fabulous studio you have. 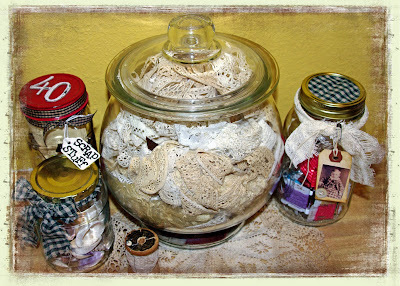 i absolutely love the idea of lace in a big jar. 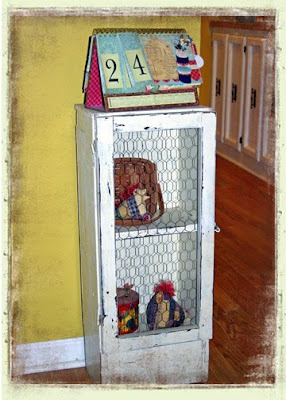 ( I might have to steal that idea) And the vintage drawers as shelves is a terrific idea. Thank you so much for playing with us today. Have a wonderful time checking out all the other creative spaces! 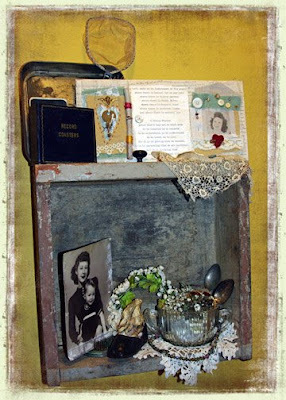 I love all of your creative studio vignettes Sheila! So inspiring. Love the glitter in the shakers...very creative! Definitely looks like such a whimsical and fun place to create in! What an amazing space you have y friend! Thank you sooooo much for sharing with us all. I barely got my photos up! Sooo much work! Blessings to you this very day. what a perfect match- those walls (I love that color! )and all of your goodies! A great creative space! I love all these cases filled with vintage treasures! They must give you an inspiration shot every time you look at them! Nice to meet you, hope you have a lovely day getting inspired at all those studios participating! What a fun bright space you have!! I love your glitter salt shakers, and your artsy drawer shadow boxes are wonderful! I love your sweet space. What an inspirational room and I love all the roosters and chicken wire! It may not be as "pretty" as yours but it gets to the job done. I love your blog and I love your space! I will be back to get more inspiration from you! Thanks for sharing! Your 'glitter shakers' are fantastic! That is the first time I've seen them used in that manner -- how could I ever put salt in a shaker AGAIN after viewing that stunning array of colors? What a beautifully creative space you live in! It is a pleasure to make your acquaintance at this lovely event; please do stop by for a visit soon! Love your vibrant, enchanting space. A girl can never have enough glitter and I so love that you store it in salt shakers. How inventive. I think it's a must that artist surround themselves with what they love. Thank you for sharing your wonderful, imaginative creative space. Loved your studio. The color was so bright and inviting. Loved your storage ideas. Thanks for sharing. What a wonderful space! I totally love the glitter in the shakers! I must do that. :0) Everything you have created is so magical and has such meaning. I know you really enjoy being there whenever you can. Thanks so much for sharing your space with me. What a happy place you have! Seeing all the glitter just about did me in. Thanks for sharing. Love the shelves of glitter! 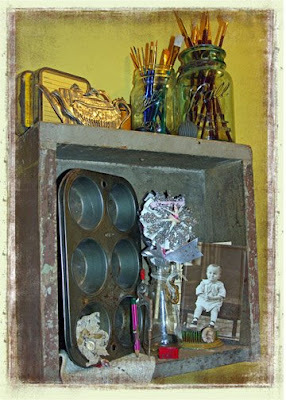 Also like how you used those drawers to display treasures - what an excellent idea. Hi Sheila, I really like your enchanting space! those glitter shakers are wonderful. You have such a pretty space to create...I really need to get myself organized..Maybe if I was, I's start creating things..You really have such pretty things..What an inspiration..
Fabulous... I am ready to come play! The glitter looks so yummy in the salt and pepper shakers! What a wonderful creative space! And how nice that you have such a big space too. You have created a nice space. I've been reading all your comments and we love your glitter shakers!! 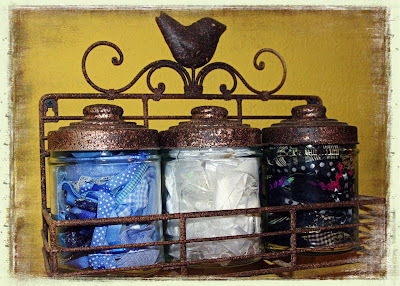 Jars add a nice touch to the decor. Your creations are very sweet. Thanks for sharing. Wonderful space. You are lucky to have such a big and organized space to create!!!! Sheila, I love your space! It's exactly what I would have guessed your creative space would look like! It has that personal blessed and distressed look that is so YOU! It's wonderful! What a lovely space you have with that nice long table. It's great that your kids can come join you in creative endeavors. I love the drawer/rotating art display you put together. Thanks for sharing! What a workspace. I wish I had somewhere that big to work from. I still have so much work to do in mine. I read down to some of your other posts and I just got a 35mm last feb. and I love it but still not sure how to use all the features. Can't stop clicking away at everything. What a lovely space you have. What a great place to create and dream. What a cute space you have! i love it!!! see ya at silver bella. love your creative space sheila! Too pretty! Your creative space is just wonderful. I've seen several creative spaces with glitter in the salt shakers and I have to say that each time I think that is the coolest thing ever! What a great space you have! Wow! Your Yellow walls are so Bright and Cheery! Lovely Studio! Thanks for sharing with us! I am still getting through the list of all the blogs who participated! I hope you will come visit mine too! This space would definitely inspire me to create beautiful things. I love the salt shakers with the glitter, what a cute idea.